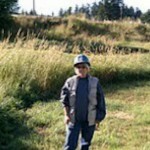 In July and August, we again participated in investigations of Legion Park and Mammoth Park. These sites are in Woodburn, located close to Salem and Portland. We excavated, mapped, and water screened. We also visited the laboratory where the recovered items are stabilized and cataloged. In 2015, we again expect to be working at these two sites. 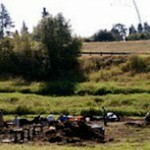 If you are a member of the Oregon Archaeological Society, please check with them for dates. The August experience is offered through Portland Community College. Please check their website or catalog for enrollment instructions. 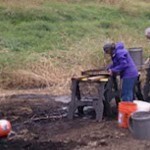 Don’t forget to take a look at the college field work page of this website. Other Woodburn site information is available at Webshots–just google astenger webshots, or http://community.webshots.com/user/astenger, and the link will take you there. The letter report of this project, and the summary of past work, can be accessed through WBHS (1).doc.